ST. LOUIS – Make-A-Wish requests often involve meeting athletes, attending sporting events or traveling to amusement parks or beaches. When it came time for 11-year-old Brett Haubrich of St. Mark School in Affton to make his wish, he not only listed none of those things but had no request at all. The answer to the last question became part of his wish – what Make-A-Wish calls “wish enhancement” to complement the main wish. Turns out he wants to be a priest, a doctor or an engineer, in that order. 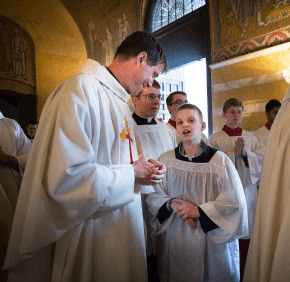 Brett, a sixth-grader who was diagnosed with a brain tumor last summer, served two Masses – the chrism Mass and the evening Mass of the Lord’s Supper – and held the book for Archbishop Carlson for prayers after the homilies. At the evening Mass, he joined 11 seminarians whose feet were washed by Archbishop Carlson and his parents brought up the offertory gifts. He also joined Archbishop Carlson for two meals; a luncheon with archdiocesan priests and deacons after the chrism Mass and a dinner with seminarians at the archbishop’s residence before the evening Mass. Best of all, he wore a collar provided by a seminarian from Kenrick-Glennon Seminary in Shrewsbury. When asked about his favorite part of the day, Brett was unequivocal in his answer. And cool, too – a term he used often in describing the day. “Just a really cool experience,” he told the St. Louis Review, the archdiocesan newspaper. His actual wish is cool, too. “Eating mangoes on a beach,” his mother said. That trip will come later. Brett’s interim “Priest for a Day” request didn’t surprise his family. Brett is the second oldest of Eileen and Conrad’s four children. He has served at his school church and at his parish, St. Martin of Tours in Lemay, which is visible from the back door of his house only a short walk away. Communion – the Eucharist, the living presence of Jesus Christ – stands out. “I like receiving the body and the blood” of Christ, he said, simply. When Brett and his family told several priests about his desire to be a priest for a day, they offered several options. He could shadow a priest for a day, spend the night at a rectory with his dad or serve Saturday morning Mass at the cathedral. Father Smith suggested that Brett serve the two Masses on Holy Thursday – the chrism Mass, which is for priests, and that night’s Mass, “which is always about the Eucharist.” Archbishop Carlson, who was with the priest when he got the request, immediately joined in with other ideas for the day – having Brett attend the seminarians’ dinner and participate in foot washing. Father Smith prepared an itinerary and delivered it in person to Brett along with a letter signed by Archbishop Carlson asking for Brett’s help at the Masses. “I handed it to him, and when he got to the first line, ‘I’m making you a priest for a day,’ his eyes got as big as half-dollars,” Father Smith said. Brett admitted to being a little nervous heading into Holy Thursday, but the events went off like clockwork. Wearing the collar, Brett processed down the center aisle with priests, deacons and seminarians at the chrism Mass – at which Archbishop Carlson blessed the oils to be used throughout the archdiocese for sacraments for the next year – and took his spot near the altar. 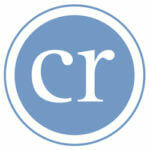 Luecking writes for the St. Louis Review, newspaper of the Archdiocese of St. Louis.